After the wettest late summer and autumn we have experienced for many years farmers will be starting to bring cattle into their winter housing much earlier than normal. In farm animal vet practice that signifies the start of the busy period across Ireland and the UK. Cattle kept indoors are prone to many more diseases than when outside at pasture. Pneumonia due to the animals being in close proximity to each other and enabling viruses to spread more easily is probably the main one we think of but I always thought the most frustrating disease outbreak was calf diarrhoea or ‘scour’ as farmers and vets alike know the condition. Scour is caused sometimes by a calf suckling too much milk from its mother but these cases are usually mild and self-limiting. Much more worrying is when one of the infectious causes of the condition is involved as the disease can affect almost all of the calves born in that season. Rotavirus usually attacks calves at about 1 week old and causes a typical yellow pasty diarrhoea which can linger for several days or even a week, causing dehydration, weakness, inappetance and sometimes death through the debilitating effects of the disease. As vets we treat these cases with i/v drips to replace the lost fluid and the farmer keeps the calf warm and well bedded to help nurse it through the weakness. In severe cases however the calf can succumb. Prevention using a vaccine on the pregnant cow before she gives birth will protect the calf through the colostrum or first milk. I have found these vaccines to be a wonderful way to keep calves safe from Rotavirus and have always recommended their use. To vaccinate though, first the farmer must know whether the scour his calves are facing is caused by Rotavirus. 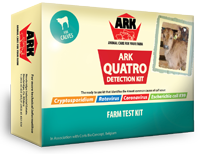 Ark Animal Health have a scour test available ‘Quattro’ to enable farmers to accurately test the faeces of scouring calves to ascertain the infectious agent. Used on fresh cases before any treatment is given it allows an accurate diagnosis to be made and preventative vaccination undertaken on the pregnant females still to calve. Used in conjunction with veterinary advice it can start to point the farmer in the right direction towards a more healthy, profitable calving season. Ark Animal Care Ltd. Copyright © 2018 – All rights reserved.